As tourism matures as an academic subject and the number of tourism higher education providers continues to expand world-wide, there is an increasing interest in its educational aspects. At the same time the development of research into education issues related to tourism means that there is now a developing literature on the subject. 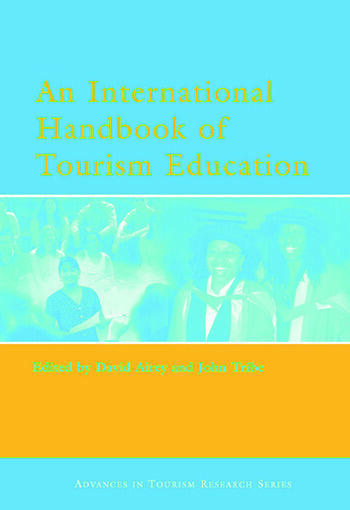 This international handbook offers a timely evaluation of the sate of the art of tourism higher education. Its global survey of tourism education offers a comprehensive basis for comparative review. In addition to setting out the development and current provision of tourism education it also addresses cutting edge issues such PhD education, non-formal education, cultural issues in learning, research and teaching, e-learning and e-assessment. It offers practical advice for the design, delivery, evaluation and resourcing of courses and concludes with a reflective agenda of issues for the future. Introduction. (J. Tribe, D. Airey). Growth and Development. (D. Airey). Overview of Research. (J. Tribe) Curriculum. Tourism, Knowledge and the Curriculum. (J. Tribe). Curriculum Theory and Practice: A Case in On-line Learning. (S. Elliott, G. Smith). Curriculum, Development and Conflict: A Case Study of Moldova. (J. Tribe). Work Experience and Industrial Links. (G. Busby). International Tourism Education. Australasia. (B. King, S. Craig-Smith). Brazil and Latin America. (S. Leal, M. Auxiliadora Padilha). The Caribbean. (A. Lewis). China. (Wen Zhang, Xixia Fan). East Africa. (Mayaka Melphon). Germany. (W. Freyer et al.). India. (Shalini Singh, Tej Vir Singh). The Netherlands. (M. Venema). North America. (S. Hudson). Slovenia. (T. Mihalic). South Africa. (M. Saayman). United Kingdom. (D. Airey). Teaching, Learning and Assessment.Teaching. (D. Stergiou). The Student Experience. (E. Wickens, A. Forbes). Issues in Teaching and Learning. (B. Wheeller). Assessment. (N. Beckett). Undergraduate Dissertations. (K. Smith). Cultural Issues in Learning. (P. Barron). E-Learning and E-Assessment. (M. Sigala). Teaching and Research. (F. Jordan). Community Education. (S. Cole). Resources, Progression and Quality. Teachers. (M. Stuart-Hoyle). Learning Resources. (L. Bibbings). Careers and Employment. (A. Ladkin). Quality Assurance. (D. Robbins). Postgraduate and PhD Education. (D. Botterill, T. Gale). Postscript. Practical Issues for Design, Delivery, Evaluation and Resourcing of Courses. (M. Moir, L. Hodgkins). Issues for the Future. (D. Airey, J. Tribe).